Anything you can’t leave home without? Nowadays, my Kindle – it used to be a Trollope, which has always been my great ‘comfort food’ in foreign places. Sounds unbelievably soppy – my wife. As Penny [Levinson] says, she’s not treated as a wife, but as a nanny. Although I’ve spent so much of my working life abroad in faraway places, I’ve always been a terrible baby about it. Because my parents [journalists Macdonald Hastings and Anne Scott-James] were barely on speaking terms, we all went to different destinations. My father would go somewhere like Africa to shoot things, my mother would go to the South of France, and my sister and I would be sent to Butlin’s with Nanny. Were you always a traveller? The only way to advance one’s career spectacularly was by going to far-flung places. People ask me, ‘Was Vietnam horrendous?’ and, of course, it was at one level. One remembers two things about it – one was the man-made horrors, the other the sublime natural beauty. You were 24 when you went to war-torn Vietnam – were you terrified? Personal raw ambition was what drove one on – sometimes one was absolutely terrified, but you also felt incredibly lucky to do these assignments which got you all over the front pages. 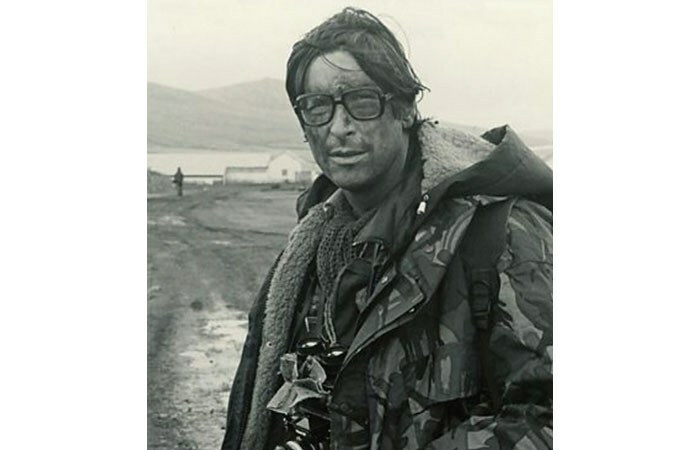 How come you were the first journalist to enter Port Stanley in the Falklands war? I was the first PERSON to enter Port Stanley. I was with the Parachute Regiment and they were ordered to halt because they thought the Argentines were almost ready to stop fighting and negotiate. I saw Stanley Cathedral and the Argentine lines about half a mile ahead. I took off my camouflage gear, put my hands in the air and thought, if I can walk up this road and live, then I can bore everybody to death for the next 30 years – which indeed I have. Can you tell me about interviewing the Vietnam veterans? I sit entranced listening to Appalachian coalminers’ sons and Arkansas hillbillies and their tales. It’s absolutely riveting. Did your height and specs make travel in the jungle difficult? Researching another book on the Second World War, I was up on the Manchuria border with Russia, and you do feel at the far end of the world. How did you file your reports in the past? In the 1973 Middle East war, when I was up with the Israeli army on the Suez Canal, I would have to drive for three or four hours across Sinai to the nearest telephone. In the Falklands, you had to get to a ship with a satellite link. Where did you go on your honeymoons? I went to Hong Kong with my former wife in 1972, and did it very unromantically. Having no money, I offered her a choice: either we can go together to somewhere like Paris or Rome or, if we go to Hong Kong, we can only afford it if you fly commercial and I’ll hitch a ride with the RAF. She settled for Hong Kong. Do you go on holiday? In the winter – we don’t like going in the summer because we love our garden. We go somewhere like Malaysia or Kenya; I work while Penny walks on the beach. Do you lie on the beach? No. I’ve always loathed sunbathing. We used to rent a ranch in Kenya, and loved riding out among the elephants and giraffes but most of them have now been slaughtered by the locals. Have you made friends when you’ve been away? We don’t make friends but we often take friends. I’m often working on a book and I only emerge at meals, and Penny and I are perfectly happy with each other’s company – at lunchtime, we read our books and at dinner we talk. Do you have a go at the local language? Absolutely not. Only speak French. American immigration can be hellish. The strangest place you’ve slept in? That’s easy – on top of Mount Kent in the Falklands War. It was so cold that you couldn’t possibly sleep. Never mind looking ridiculous in order to be comfortable.